Indoor Mason Jar Herb Garden | Indoor Mason Jar Herb Garden makes a great addition to your kitchen. With very little effort you can have delicious flavors in a jar for your everyday cooking. Easy and convenient! Hey friends! I hope you all are are doing well. While at lunch with two great friends last week, I became inspired to make this Indoor Mason Jar Herb Garden at their suggestion. Thanks guys! ;) This was such a fun project. We have been having some unseasonably warm temperatures here in south central Virginia for the last couple of days. I’m quite sure it’s not here to stay and that mother nature is just teasing us. I know this crazy Virginia weather can turn around fast, and we could have snow in March. But for now, I’m enjoying these warmer days. This so easy to pull together and you probably already have most of the items on hand. Add the pebbles to the mason jar. The pebbles serve as drainage and will keep the plants roots from sitting in water. After the pebbles you’ll add the soil. 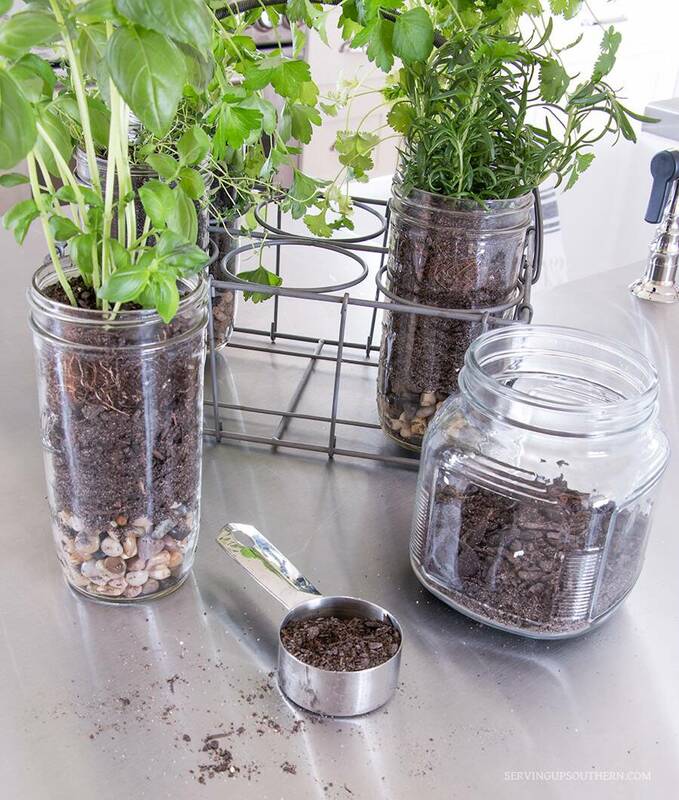 Break up the root ball on the plants and shake some of the dirt off before placing them into the jars. Then add a little more soil around and on top of the root of the plant. Give them a good drink of water and you’re all done. As you can see, I have an empty space because I could only find 5 plants, but I plan on filling that in with dill. I used the pint and a half size mason jars like these, and the accent pebbles are from Walmart. Here they are all planted. I put mine in a drink carrier. It makes it easy to carry them out onto the porch to soak up some sunshine on warm, sunny days. You can also transplant these into your garden when there’s no longer a threat of freezing or frost. The combination of planting these little herb gardens and the warmer days have sure given me spring fever. How about you? Are you ready for spring? I am so ready for spring, and this herb garden is awesome! How pretty! The fresh green color is a feast for the eyes! The carrier is adorable! Is it old, or can they be purchased? I’ll bet the herbs smell amazing in your kitchen! Thanks for this great little “how to” for keeping our herbs in mason jars – and making it look this cool! Someone else mentioned the container and i agree, if you can find and source that product for your readers – it would be a win for both!